The Portfolio by UniBind is a versatile, fully customizable document presentation and storage solution. With the portfolio, you are able to create then deliver your branding either to prospective clients or employees. This presentation box does not require any thermal binding equipment in order to assemble. Simply use the clamps to fold then lock into place. Designed for use with UniBind’s document presentation system such as the UniCover Hard, UniCover Flex or Custom Spines and Coversets, easily create and store your presentations. Additionally, UniBind’s portfolio can utilize our customization services to add either your logo or artwork with hot-foil stamping or full-color printing. The Portfolio by UniBind is a versatile as well as customizable document presentation and storage solution. With the portfolio, you are able to create then deliver your branding to prospective clients or employees. This presentation box does not require any thermal binding equipment in order to assemble. Simply use the clamps to fold then lock into place. 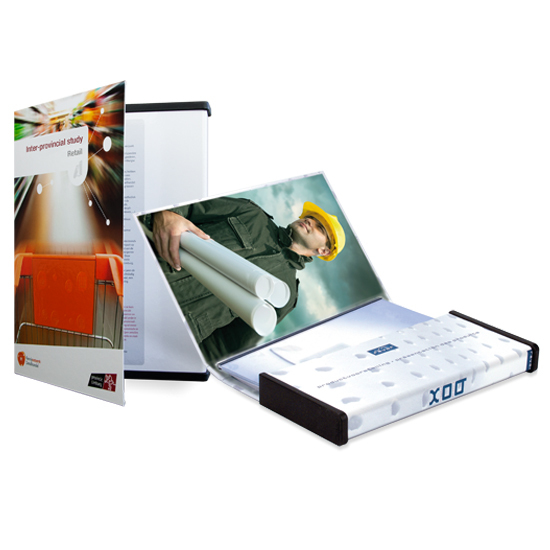 UniBind offers a wide variety of accessories for this presentation box. Furthermore, all of UniBind’s UniCovers will easily fit into the portfolio. Due to the wide branding possibilities, the Portfolio is an undeniably perfect fit for a variety of industries. This hardcover presentation box allows you to customize with either foil printing with the UniFoil Printer or foil stamping. Easily add your company logo, recipients names and much more. Additionally, this presentation box is available in multiple colors as well as sizes. Stand out from your competition and generate return business with these beautiful, fully customizable presentation solutions. Coupled with UniBind’s UniCover Hard, UniCover Flex, as well as tab accessories make a fully customized presentation solution with your branding at the forefront. To learn more about our Foil Stamping as well as Foil Printing options, please contact one of our sales representatives.